1. IKEA ANTILOP HIGH CHAIR. Though there are dozens of other cool high chair options, not one of them is going to take the place of my beloved little Antilop. It’s easy to assemble, easy to clean, can be pulled up to the table, and easy to store away when you don’t need it. For $25, with the optional tray, this simple high chair just can’t be beat. I used it for two children from their first solid meal until they chose to move up to a grown-up chair and recommend it to everyone. 2. PHIL & TEDS TRAVELLER PORTABLE COT. We were on a road trip when we realized we left our pack-n-play at home. Turns out this was the best mistake we ever made because we picked up a Phil & Teds Traveller and donated the pack-n-play as soon as we got back home. The Traveller is super light, fits in our suitcase, and is easy to put together and pack back up. If you’re a traveler, then you’ll love the Traveller! 3. 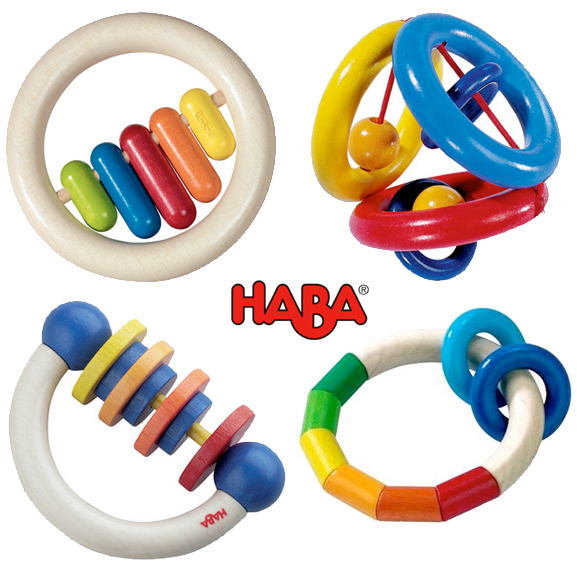 CLUTCH TOYS AND RATTLES FROM HABA. We have three of the four pictured here and they are the rattles I am going to put away and keep for my grandchildren. They are beautiful, easy to hold and even I like to hold and fidget with them. 4. JAZZY TOES ORIGINAL VARITY. I take issue with shoving tiny baby feet into tiny baby shoes no matter how cute they are until baby is walking. So until then, these comfy little socks are an adorable alternative. Girls varieties are also available. 5. BABY GOGO. Every little one should have their very own baby doll to take care of and my favorite all around choice is Baby GoGo. Both boys and girls should have the opportunity to learn to nurture and the gender neutral Baby Gogo doll is perfect for either.